The participating presses include And Other Stories, Comma Press, Dodo Ink, enjoy your homes, Girasol Press, Gordian Projects, Little Island Press, Longbarrow Press, Rachael hand, Spirit Duplicator, The Poetry Business, and Tilted Axis Press. The fair will include handmade artists’ books, poetry, fiction, art writing, literary criticism, zines, and much more. Performances and readings include the internationally known New York based experimental poets Karen Mac Cormack and Steve McCaffery. The whole day, including the performances and readings, is free! Watch the video to meet the presses and performers. Between now and Christmas buy any one of our publications: Arcalumis by Tom Rodgers, East Wind by Brian Lewis, Echoes From A Berlin Childhood by Helen Clarke, Lectolalia by Emma Bolland, or the MilkyWayYouWillHearMeCall pamphlets by Judit Bodor, Emma Bolland, and Tom Rodgers, and receive a free copy of Place and Memory: an emotional exploration of ‘city’ by eight artists and writers. We are delighted that our two new photo/text publications, Arcalumis by Tom Rodgers, and Echoes From A Berlin Childhood by Helen Clarke, are now in national collections, including The V&A Art Library, The Saison Poetry Library at The Royal Festival Hall, The Winchester School of Art’s Handling Collection, and the Women’s Walking Library. This means that all of our publications are now in national public collections. 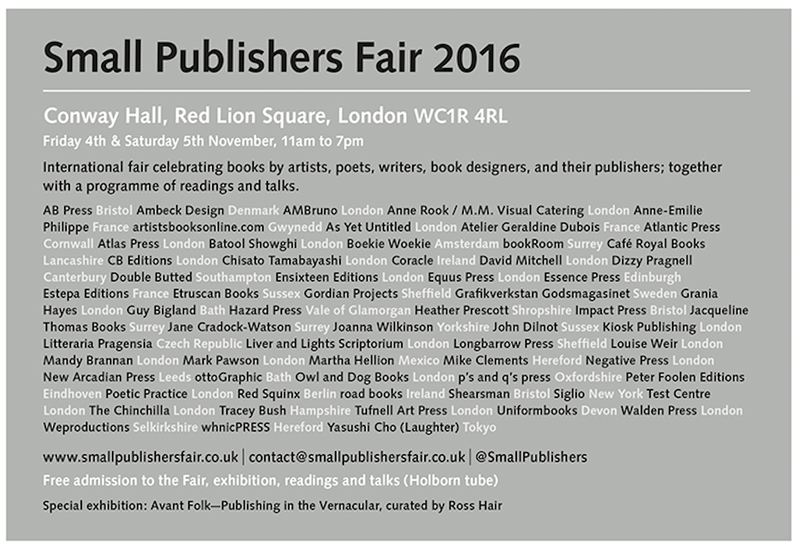 Gordian Projects are delighted to be one of the presses invited to take part in the Small Publishers Fair, Conway Hall, London, Friday 4th and Saturday 6th November. Featuring specialist art and writing presses from Scotland, England, Wales, Denmark, France, The Czech Republic, Germany, Mexico, Ireland, Tokyo, USA, Sweden and the Netherlands, the fair is accompanied by a programme of readings and events. 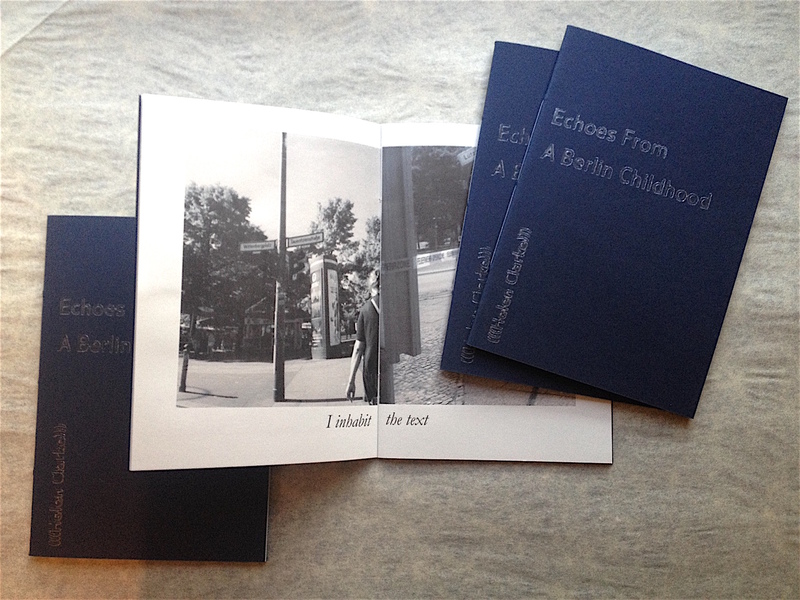 As well as showing our current titles, we will be launching two new titles at the fair: Tom Rodger’s two-part Aracalumis, a meditation in abstract analogue photography; and Helen Clarke’s Echoes from a Berlin Childhood, a photo-text poem recording her walks around Berlin in search of Walter Benjamin. Between now and the Fair we are running a very special ‘two-for-one’ offer: buy any of the following titles: East Wind, Lectolalia, The MilkyWayYouWillHearMeCall pamphlets, and receive a copy of Place and Memory absolutely free. 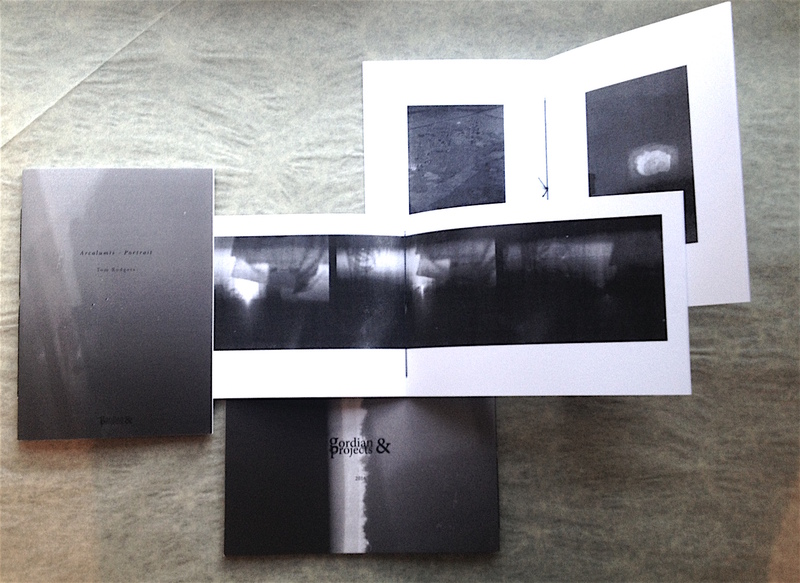 Simply click on the normal ‘buy now’ button, and we will include a copy of Place and Memory in your package. 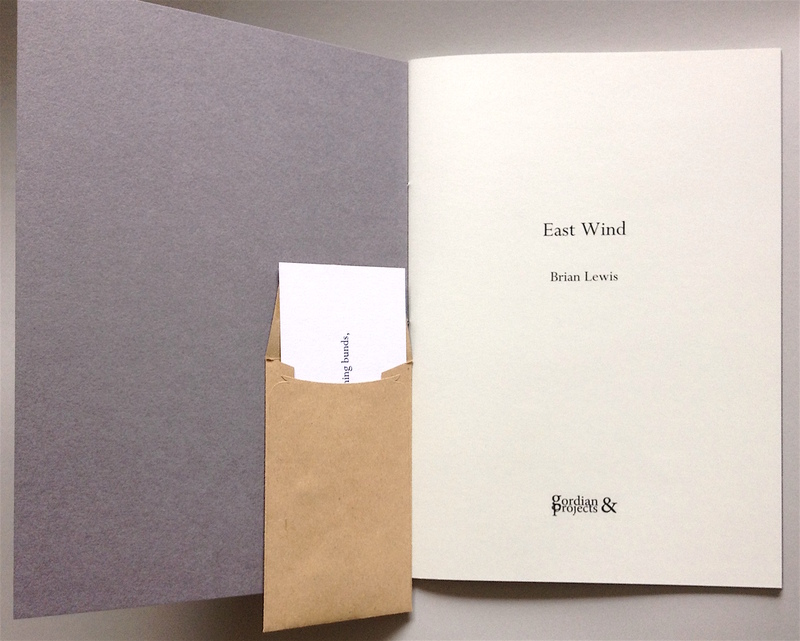 We are delighted to be launching a second edition of East Wind by Brian Lewis. 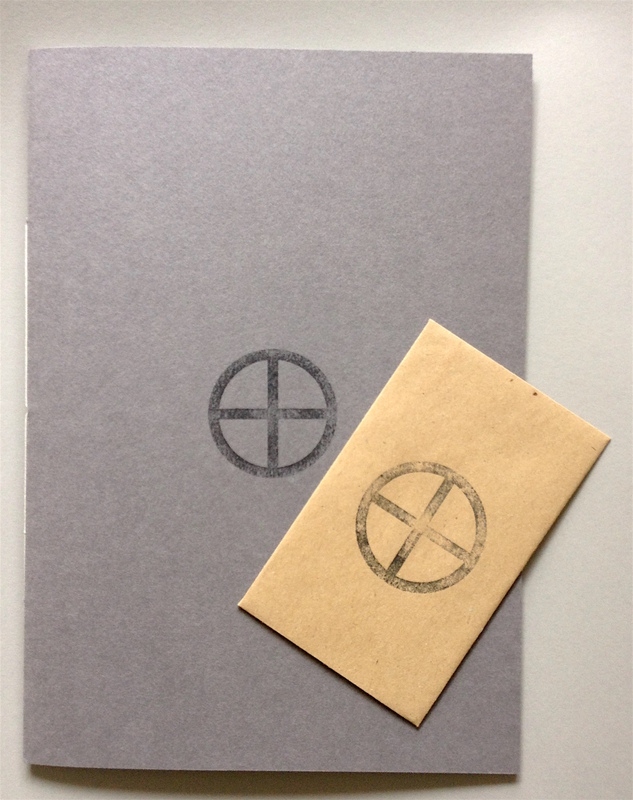 This second edition of 40 unnumbered copies is published as a single hand-stitched pamphlet, and comes with an individual haiku, presented in an envelope as an artist’s multiple. 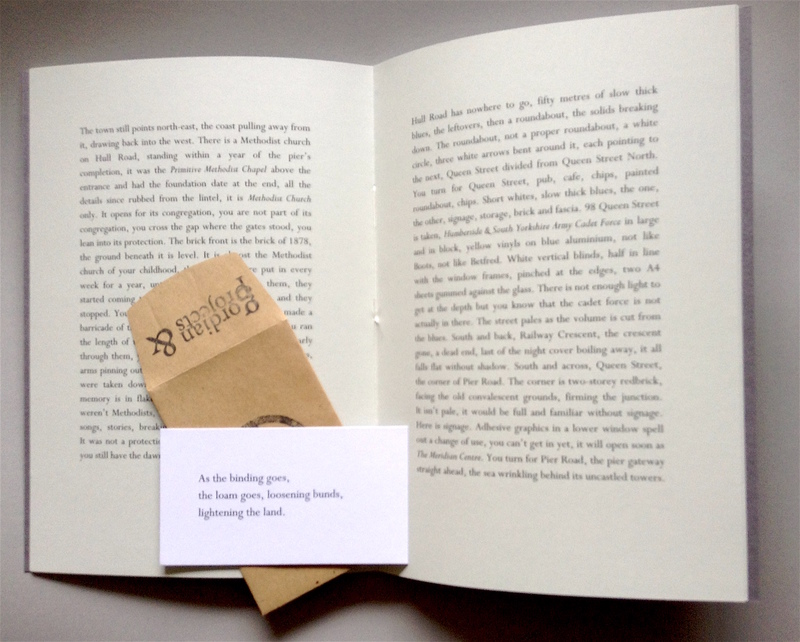 The first edition, a set of three hand-stitched and stamped pamphlets in a numbered edition of 25, sold out within two weeks of release. East Wind is a sequence of lyrical essays and haiku that narrate the author’s continuous 24 hour walk from Hull to Withernsea and Hornsea over the 10th and 11th May 2014. We will be publishing a full collection of Lewis’ essays and poems, Eastings, in 2017. We are very pleased to see that the organisers chose our milkywayyouwillhearmecall pamphlets to promote the Artist’s Book Market the BALTIC Centre for Contemporary Art on Saturday 18 & Sunday 19 June 10.00-17.00. The event is FREE and accompanied by a series of artists interventions. We will of course be there on both days promoting our work and sharing our table with the fantastic Longbarrow Press. Come and see us! 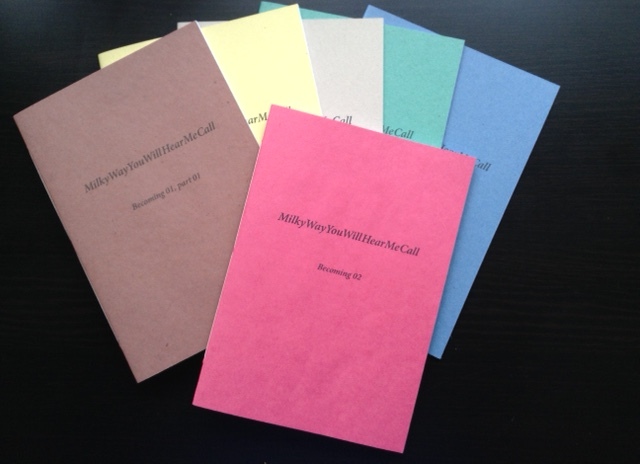 The MilkyWayYouWillHearMeCall pamphlets have just been purchased by the Victoria and Albert Museum for their Artists’ Books collection at the National Art Library. Until the end of January we are offering the complete set of the 01 series, five pamphlets, plus the first in the 02 series, for just £20 + posts and packaging, a saving of £5. 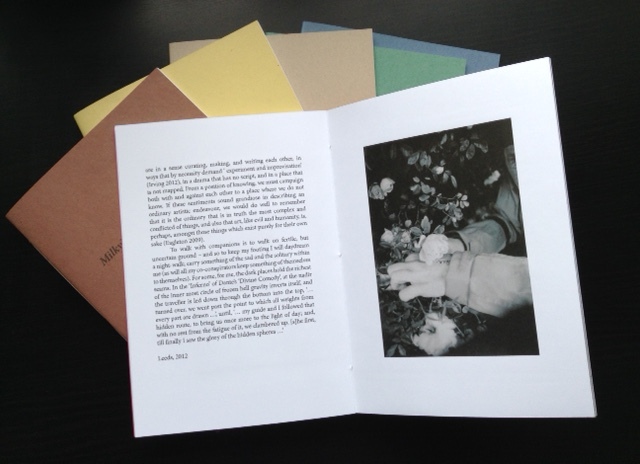 Each pamphlet is strictly limited to an unnumbered edition of 25. Please note that delivery will not be immediate, as each pamphlet is hand stitched to order. MilkyWayYouWillHearMeCall is a collaborative research project by artists Emma Bolland and Tom Rodgers and curator Judit Bodor exploring the relationship between place, memory and mourning. The title of the project is taken from the novel Nineteen Eighty by David Peace, a fictional re-imagining of the hunt for Peter Sutcliffe, the ‘Yorkshire Ripper’, in the late 1970s and early 1980s in West Yorkshire. Using fragments of the text as their starting point, the research involved visiting sites that are described in the novel and gathering material to create a co-authored body of work which seeks to integrate visual practice, curatorial intervention, research, documentation, fictional, and theoretical writing. 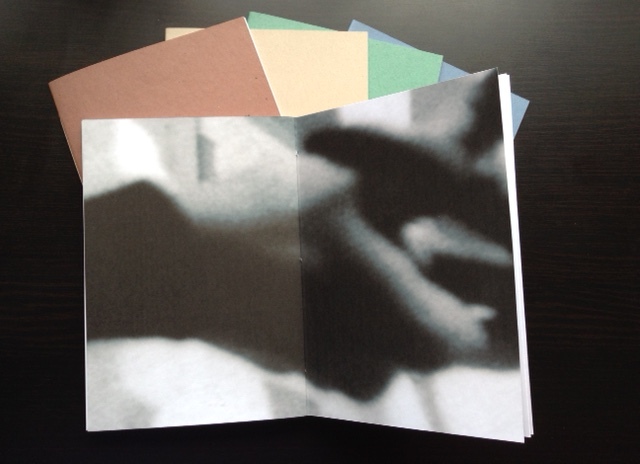 Becoming 01 is a set of five pamphlets that focus on gesture and the hand using film photography and fragments of texts. Becoming 02 focuses on a motif of the wild roses found growing at one of the sites. Illustrated with film photography and drawings, it features a full length essay Snow White and Rose Red which examines risk, the vulnerability of the body, and the nature of risk and collaboration. To order please select from the postage options for the full set of 01 below, and 02 will automatically be included in your delivery. Available until 7pm Friday 18th December only! Buy Emma Bolland’s LECTOLALIA (a romance), and receive a free, signed edition of her multiple MELANCHOLIA. LECTOLALIA (a romance) (2015) was created by Emma Bolland for the Leeds College of Art & Design ‘Library Interventions’ residencies. For the Interventions, artists are invited to respond to the library and its collections. Bolland’s response deals with seduction by words and texts, and she undertook a free-associative drift through the stacks, selecting books intuitively by heft, texture and appearance. Fragments of phrases taken from the books she encountered are incorporated into the work. In a performance of the draft text she invited the audience to annotate the manuscript, and these annotations are included in the publication as endnotes, as is a bibliography of the books pulled from the shelves. This bespoke, signed, and hand-numbered first edition of 150 copies is published by Gordian Projects in association with Leeds College of Art & Design and is priced at £10.00 plus post and packaging. Typeset in Perpetua and Perpetua Titling, and printed on pearl grey paper, the edition is hand-stitched, and issued with hand-printed covers and contrasting dust jackets created by the author in multiple colour combinations ranging from neutral to bright. MELANCHOLIA (2005) is an unnumbered edition of 150 black rosettes, conceived by the artist as a badge of sadness. There are only thirty of these rosettes remaining. Should the combined offer have sold out before your order arrives you will be offered a full refund.